The Student and Exchange Visitor Information System (SEVIS) tracks and monitors the status of international students in the US. It is primarily used by the US Department of Homeland Security (DHS) to “maintain information on the Student and Exchange Visitor Program (SEVP), certified schools, and the F and M students who come to the United States to attend those schools.” SEVIS also includes information on J-1 visa exchange visitor programme participants in the US. The system came online in 2003 and, since fall 2009, has released a series of quarterly reports entitled “SEVIS by the Numbers” that represent an important additional source of data on international students in the US. The Institute of International Education’s (IIE) Open Doors reports are widely referenced for in-depth findings and trends for foreign students in the US, but the SEVIS data is an interesting complement to sources such as Open Doors in a number of ways. First, the SEVIS system is web-based and its reports are based on real-time data that provide a snapshot of international students in America as of the report date. Open Doors, in contrast, is based on survey data from the previous year. The most recent “SEVIS by the Numbers” report was released on 15 January 2014. Because of its broader orientation and its currency, the report describes a larger population of international students than is found in the most recent Open Doors report. SEVIS indicates that as of 15 January 2014, there were 991,957 international students enrolled in US schools (and holding F-1 or M-1 visas). Among those were 5,599 students enrolled in primary schools and a further 50,526 students in secondary school programmes. There were a further 179,253 students in the country on J-1 (exchange visitor) visas. 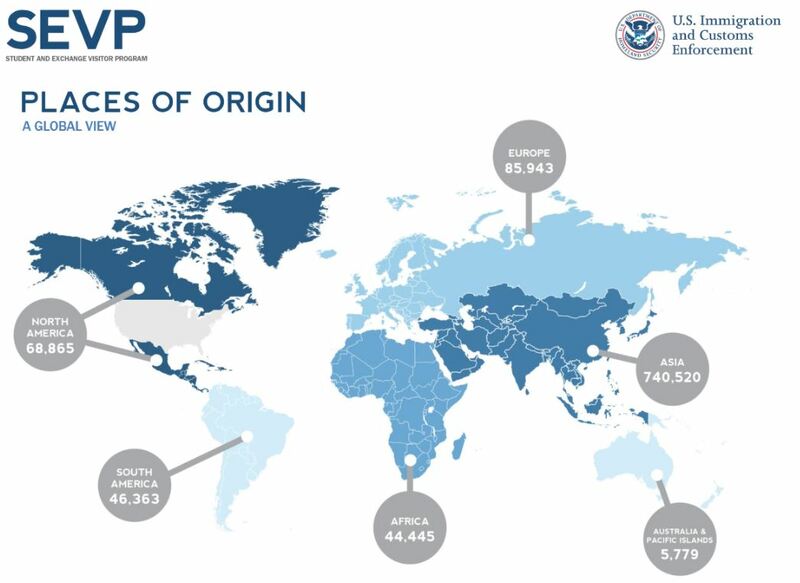 SEVIS echoes other data sources in pointing to Asia as the major region of origin for those 991,957 F-1 and M-1 visa holders. As the following illustration reflects, 74.65% of foreign students in the US come from Asia. The balance, in order of declining share of student population, came from Europe (8.66%), Canada or Mexico (6.94%), South America (4.67%), Africa (4.48%), and Australia (.58%). Looking more closely at the dominant source region of Asia, SEVIS provides the following breakdown for major source countries. China accounts for an impressive 29% of all international students in the SEVIS data, and India a further 11%. Put another way, the two countries combined accounted for 40% of F-1 and M-1 visa holders in the US, and more than half of all Asian students enrolled with US schools this year. South Korea, a historical leading source of students for the US, remains a significant market for American schools and Vietnam has registered some significant gains in recent years, jumping nearly 13% from July 2013 to January 2014 alone. The following chart provides a further view of leading source countries for the US, reflecting both the strength of established markets and the growing importance of key emerging markets such as Vietnam and Brazil. 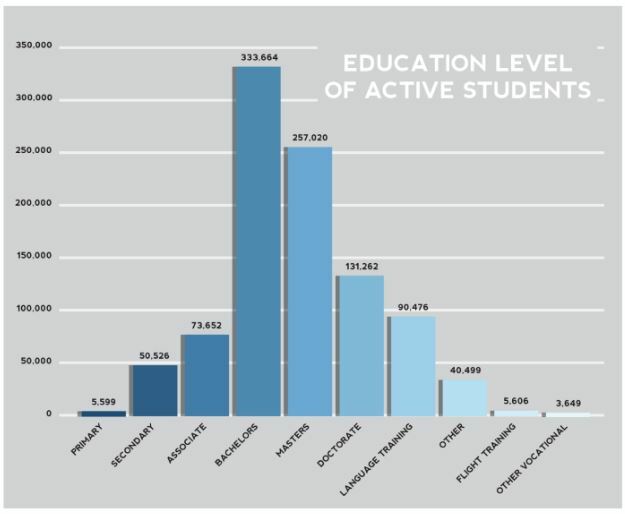 Turning now to the question of what foreign students are studying in the US, SEVIS again provides some interesting insights and notes that 73% of students are enrolled in higher education programmes at the Bachelor, Master’s, or Doctoral level. 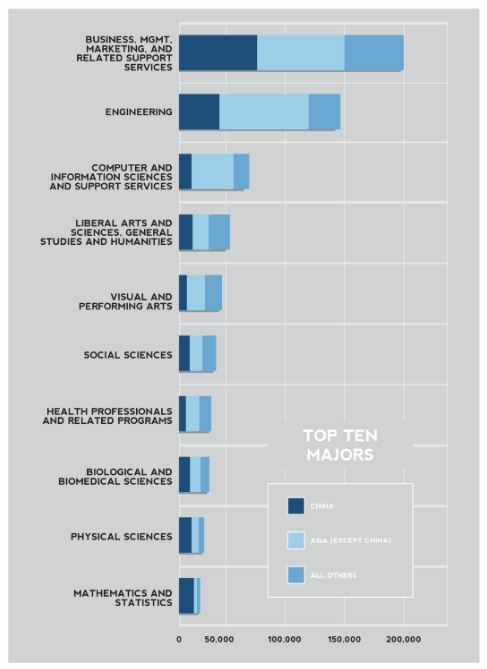 The following chart provides a breakdown across all levels of study. The SEVIS findings with respect to most popular programmes of study reflect those in other major studies, including Open Doors. The following chart shows the distribution of enrolment for the most popular programme areas, and breaks that enrolment down into three components to show the proportion accounted for by students from China, students from Asian countries other than China, and for all other countries of origin. This entry was posted in Asia, Higher Education, K-12, Language Learning, Most Popular, North America, Regions, Research, United States, Vocational, Work Abroad and tagged student visas, student mobility, colleges with international students, student enrolment, study abroad.